I have been on the hunt for a product that would help us get a better nights sleep without breaking the bank. With the extra expenses we’ve had this summer, a new mattress just wasn’t in the budget. A few months back I worked with Sleep Innovations on their REMedy kit for back to school. My daughter experienced some of the best sleep she’s had in years on her mattress topper. When Sleep Innovations offered to have Shout! Media review their 4” Mattress Topper and Rejuvenation Pillow I was beyond excited. Sleep in luxury on this 4-inch high memory foam mattress topper from Sleep Innovations. To ensure comfort and support, the king-sized topper combines 2 inches of pillow-like microfiber and 2 inches of 100-percent polyurethane memory foam with a 3-pound density. The memory foam responds to an individual’s body weight and temperature as it conforms to embrace the body’s shape. By hugging the curves rather than pushing back against the body, the topper offers pressure point relief to increase circulation. Memory foam also holds the body in proper alignment and minimizes motion transfer, enabling couples to sleep more soundly together. To optimize air circulation and regulate the surface temperature, the mattress topper includes patented open-cell technology. A 300-thread-count 100-percent cotton quilted cover protects the topper; an attached bed skirt fits over the accompanying mattress to prevent the topper from sliding around. Removable for easy cleaning, the topper is washing machine-safe. An antimicrobial finish on the topper deflects mold and mildew while the memory foam’s hypoallergenic nature provides comfort for those with allergies. A great compromise to a mattress purchase, the topper can be used on top of innerspring or memory foam mattresses alike and comes in twin, full, queen, and king sizes. The King sized topper measures 80 inches long by 76 inches wide by 4 inches high. I was surprised when the package came and it was a fairly reasonable sized box. It weighed a ton though! To the left is the actual memory foam and to the right is the mattress protector/cover for the memory foam. After unpacking the memory foam, letting it “rest” a bit and reading the directions I found that I should allow 72 hours for full expansion. The instructions mention that it is more than alright to sleep on it during the recovery period as our body heat will actually help in this process (good! I’m not sure we could have waited 72 hours to try it). I was pretty impressed with the initial expansion as it was thick and inviting to begin with. 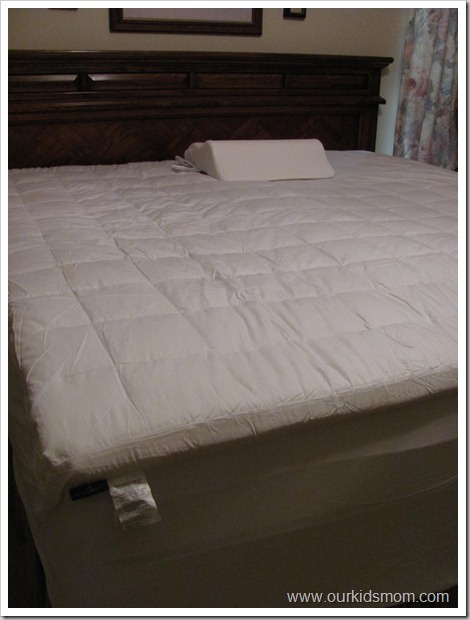 We put the mattress protector on, unzipped the cover and positioned the memory foam… then we zipped it up like a sleeping bag! The topper measures 80 inches long x 76 inches wide x 4 inches high when all is said and done. The cover features a quilted/padded top that mimics a pillow top. It was incredibly inviting and as soon as the camera was put down all of us climbed on the bed . So, how did the sleep test go? Our bed, before topper, has two big sags from where my husband and I lay. It’s way beyond it’s prime, but what are you gonna do when the money just isn’t there? You can see that my husband did still sink a little when laying on the topper, but there was a plush support there that the mattress no longer supplies. I fell asleep very quickly that night! Up to this night I had been waking at least twice a night and having difficulty falling back asleep around 2 am. Now I not only fall asleep quickly, I sleep more soundly and my 2 am awakenings are few and far between! I am so happy to have found a product that will extend the life of our mattress for awhile so we can save up to replace it. The mattress topper comes with a limited ten-year warranty, too! 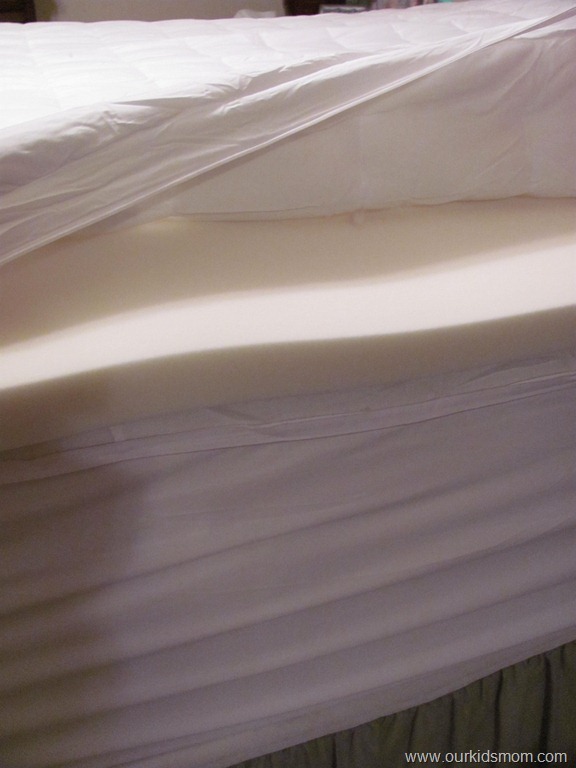 A Memory foam mattress topper placed on a conventional mattress results in far fewer areas of pressure and less pressure compared with the same conventional inner spring mattress without the topper. 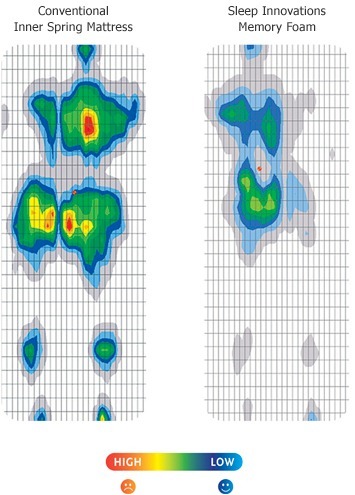 Memory foam reduces pressure points by evenly distributing your body weight across its surface. The push-back pressure, (shown in red) experienced with conventional innerspring mattresses, is virtually eliminated with memory foam. I would highly encourage anyone that has an older mattress set that they’d like to extend the life of to purchase a Sleep Innovations Mattress Topper. Sleep Innovations also sent us a Rejuvenation Pillow to help us on our quest for a great nights sleep. The Rejuvenation Pillow is designed to support you at the ideal sleeping angle, relieving pressure, keeping your air passages open and maintaining correct, comfortable head and neck alignment. You’ll breathe better, so you’ll fall asleep faster and sleep more soundly-with fewer nighttime awakenings and interruptions. The Rejuvenation pillow is unique in that it not only helps you get a good night’s sleep, but if will give you a deeply restful, recharged rest to get you ready for the morning. The Rejuvenation Memory Foam Pillow helps provide more REM (Rapid Eye Movement) sleep: the deeply restorative sleep you need most. The increased air flow will provide vital oxygen your body tissues need to repair themselves overnight. The Rejuvenation pillow offers a cradling comfort of top quality premium memory foam. Between the built-in neckroll and the shoulder support, your head and neck are at the ideal angle and you’re the pressure on your neck and chest is relieved allowing your lungs to expand more effectively. It was Kaytlin’s turn to test drive a memory foam pillow. After all of us eagerly took our turn laying on it to see how it felt, she eagerly accepted the challenge. Although she has a Sleep Innovations mattress topper, she still has problems with her neck and shoulders on occasion. She is a side sleeper and was glad to see that the contour is as effective for side sleepers as it is for back sleepers. She hasn’t complained of neck or shoulder pain in a couple of weeks now and when asked if someone else in the family can try the pillow, she refuses . I am a little sad I didn’t insist on sleeping on it a few nights as my initial test rest on it was very comfortable and the memory foam wasn’t too hard (I’ve tried a few of those!). I’m happy that she has found her sleep solution, though. 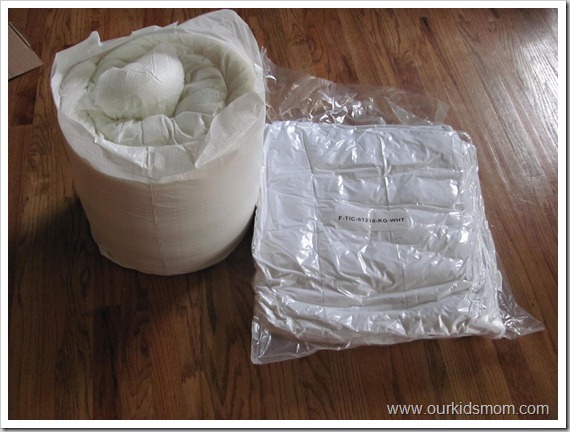 ONE OurKidsMom reader is going to win both the 4” Mattress Topper (choice of size) and the Rejuvenation Memory Foam Pillow! This campaign is being cross promoted through Shout! Media. Check out these other great reviews to hear their thoughts about Sleep Innovations! This giveaway ends at 12:01 AM EST on September 29, 2011. I’d love to also have the 12″ Memory Foam Mattress. I love the Vibes Vibrating Lumbar Support Back Rest on there website…i soooo need one of those! I have had neck surgery and still have no relief from the neck, shoulder and back pain. I’ve tried those other fancy pillows that are supposed to be good for my problem but still no help. I would love to try the rejunevation pillow that has a shape that appears to support your neck, right where mine really hurts. I like the matresses or the topper! I really need the Vibes Massaging Gaming Chair because I am on the computer a lot of the day entering contests, reading blogs, reading email and facebook. I also have an online business. Sleep Innovations’ memory foam is made with the latest manufacturing technology, so all of our memory foam products have “open cells.” Open cells are designed to encourage air flow. Open cells dissipate the heat released by your body and head during sleep. Unlike the memory foam products of years ago (which had tighter, closed cells that did retain heat), today’s Sleep Innovations products are temperature neutral. I love the Vibes Vibrating Lumbar Support Back Rest. I have horrible back problems and this would come in so handy especially after two surgeries. I learned 18 degrees is the ideal pillow angle. My favorite is the Cotour pillow. I’d love a 12″ Memory Foam Mattress. I would like the BOB or the vibes massaging game chair. Our 3 state-of-the art facilities fabricate the highest quality foam products in the world!! and its made in the USA!!! I learned that Memory Foam was invented by NASA to help astronauts with extreme G-Force stress. NASA has given us so much. I like the 2 in 1 pillow! I actually love the giveaway item, it would be so beneficial for me and my husband. Our mattress needs replacing and this would be perfect till we were able to afford to purchase a new mattress. They have a bed that can be stored as an ottoman or a bench. I think this is way cool! The memory foam mattress topper is my favorite! I love that it comes in different thickness for various options of comfort. I really like the 2-in-1 pillow. The B.O.B. looks like a really cool product! I like the Vibes vibrating lumbar support. I learned that it is cordless so is easily portable! 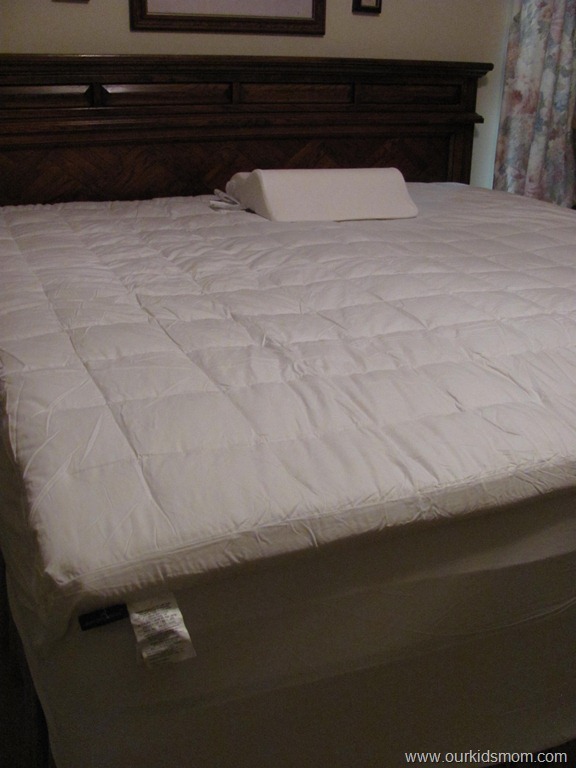 Mattress Toppers are like sleeping on clouds, I don’t have one, but I have tried one out and it is soooo nice! I like the Matrress Toppers! I learned that Memory Foam was invented by NASA to help astronauts with extreme G-Force stress. The vibrating lumbar support is my favorite! I learned that today’s Sleep Innovations products are temperature neutral, which is great because I am always cold, but my hubby is always hot! Massaging game chair is awesome! I learned that Sleep Innovations manufactures 100% of its memory foam in the United States. Good for them! My favorite item they carry is the 2 in 1 pillow. The reversible pillow has the luxurious, cradling comfort of memory foam on one side and soft micro-fiber on the other. I LEARNED YOU CAN GET A BETTER NITES SLEEP,COZ UR WEIGHT IS DISTRIBUTED MORE EVENLY,NO PRESSURE POINT SORENESS. I learned that the rejuvenation pillow is designed to keep your airways (through your mouth and nose) open! Interesting! I learned you get a better night’s sleep because your weight is distributed more evenly. I like the pillow-top mattress enhancer too! I didn’t know that Memory Foam Mattress Toppers came in different sizes ( 3″, 4″). I thought it was a one size mattress. I love this idea. My favorite item I saw was the Vibes Massaging Gaming Chair! I learned that it promotes correct, comfortable head and neck alignment which would be good for me because every single morning I wake up with my neck and the back of my head aching. Rejuvenation pillow is something I want to try to get rid of my ache in my shoulder and neck that I get with the pillow I have now. Would love to try the pillows! I learned that Sleep Innovations manufactures 100% of its memory foam in the United States. I like the Gusseted Memory Foam Pillow too! I want the Rejuvenation Pillow. That looks like just what I need. I like the mattress topper. It looks like it would help my back get better support. I would like to try the Memory Foam Cluster Gusseted Pillow. I like the 12 inch memory foam mattress. I like the 12″ Memory Foam Mattress. I love all the mattress toppers. They like they would make for a good nights sleep. Vibes Vibrating Lumbar Support Back Rest is a product I would love to have~!! I would love to have one of the Vibes Vibrating Lumbar Supports!! I would love to try the memory foam topper! i would love the massaging lumbar pillow. I would love the 12″ Memory Foam Mattress!! My favorite item is the Memory Foam Mattress, my back screams for one! I learned that they have an anti-snore pillow which would be wonderful for my boyfriend! I learned that we NEED a mattress topper to extend the life of our old mattress- Which isn’ t that old but definately acts it! I learned that Memory foam products are naturally resistant to dust mites and are hypoallergenic. Our patented memory foam technology reacts to the temperature of your body as soon as you lie down. Immediately, the topper begins to conform to your body’s unique shape, and starts to distribute your body weight over the topper surface. This dispersion of weight alleviates the pressure points commonly experienced on a traditional inner-spring mattress. Fewer (and less intense) pressure points allow you to have better circulation while you sleep which results in waking feeling refreshed with restored energy levels to meet the challenges of the day. Better circulation, in turn, results in less tossing and turning, and fewer interruptions. This unsurpassed comfort comes with yet another unique benefit – proper spinal alignment. The outcome is a better, restful and healthier sleep. I learned that all Sleep Innovations products are made in the USA. I like the contour pillow! IT’S MADE IN THE USA…i wont buy anything else…nothings made better! I’d LOVE to get the Vibes Vibrating Lumbar Support Back Rest for my driver seat in my SUV. I like the Vibes Massaging Gaming Chair. My favorite item is the Memory Foam Gusseted Pillow. learned: Sleep Innovations manufactures 100% of its memory foam in the United States. Domestic production allows us to ensure the highest quality goes into every product, and that every item meets the highest safety standards in the U.S.A. It is important to note that many memory foam products are imported, and that they often do not all meet the safe, strict quality and safety guidelines met by all Sleep Innovations products. I learned that upon receipt, you have to wait 48-72 hours for the mattrres to return to its’ original shape prior to use. I learned that all Sleep Innovations products are made in the USA!! My favorite item is the Memory Foam mattress. I like the countouring pillow. I like the pillow – this looks nice. I like the 2-in-1 Pillow! i have one of their pillows for neck support, and i love it! its wearing out, ive had it for a long time, but cant sleep without it! I would love to have a 12″ Memory Foam Mattress. Our mattress is 10 years old and ready to hit the curb. With hubby and I both suffering from back injuries we need a new mattress badly! If I could wish for anything it would be the 12″ memory foam mattress for sure! wow- I would love that. Their mattresses look so incredibly comfortable! My favorite item that they carry is the 4 inch memory foam mattress topper. It looks from the pictures of back pressure that it could relieve a lot of the pain I am having. I have a low back pain and am going to have surgery in a few weeks and I think the lumbar massager would be really hnelpful for me. I learned that their products are made here in the good ole USA! I want the memory foam contour pillow. I learned that the average person spends 1/3 of his/her life in bed. I would like the 2 in 1 pillow. The look of the mattress toppers definitely looks very inviting to sleep in. I also like the pillow, it seems both will give me a very good and satsiying sleep. I haven’t had a goodnight sleep lately, I might give it a try to have both of these items. Nice article and really helpful. Thanks! I would love to have one of their memory phone mattress! I also love the Bed-Ottoman-Bench. Very cool! Thanks! Love the B.O.B – Small Spaces. So comfortable for the occasional guest situation. I would love to try the Memory foam Mattress! I like the Memory Foam Cluster Pillow! I learned that those foam pillows come in more than one shape! I have the normal looking one, but that other design looks worth trying. I would like to have the gel foam mattress topper that Alleviates Pressure points. That sounds awesome! I would like to try their Vibes Massaging Gaming Chair. I like the 2 in 1 Memory Foam/Micro Fiber Pillow. Sounds so comfy! I didn’t know they made mattresses in addition to mattress toppers; I would love to try this! I like the Vibes Massaging Game Chair. I would love to get the Vibes Massaging Gaming Chair for my boyfriend! I learned that these products have a patent pending 18° Ideal Angle. My favorite item is the Pillow Top Mattress Enhancer. Sleep Innovations has so many wonderful products, it’s hard to choose. I can honestly see us purchasing the Pillow-Top Memory Foam Mattress Enhancer. Thank you! The B.O.B. looks awesome. It is great for company and when you dont have it folded out as a bed you could use it as a nice seat. I like the memory foam mattress. I follow your blog on GFC, subscribe to your email and like you on Facebook! I would love to win this! I also like the contour pillow! Thanks so much for the fantastic giveaway! I like the Pillowtop Mattress Enhancer. I did not know that the pillow promotes correct, comfortable head and neck alignment. I like the Memory Foam Cluster Gusseted Pillows. I would love to try the Memory Foam Cluster Gusseted Pillow. My neck is not agreeing with our current pillows. 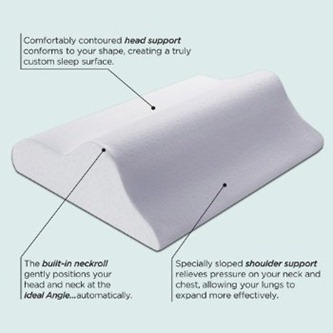 I would love the contour neck pillow, I bed it would help my neck pain! Really want one of the memory foam contour pillows. Hopefully my neck and shoulder would hurt less because of it. I have one of the memory foam bed pillows and even tho it took a few days to get used to it, it is now the ONLY pillow I can sleep with comfortably. I always wake up with a headache if I try another. I learned that PBDE stands for Polybrominated Diphenyl Ether, which was used as a flame-retardant chemical in a variety of household items. The accumulation of PBDEs in the environment has been linked to health problems including liver toxicity, thyroid toxicity, and neurodevelopment issues. 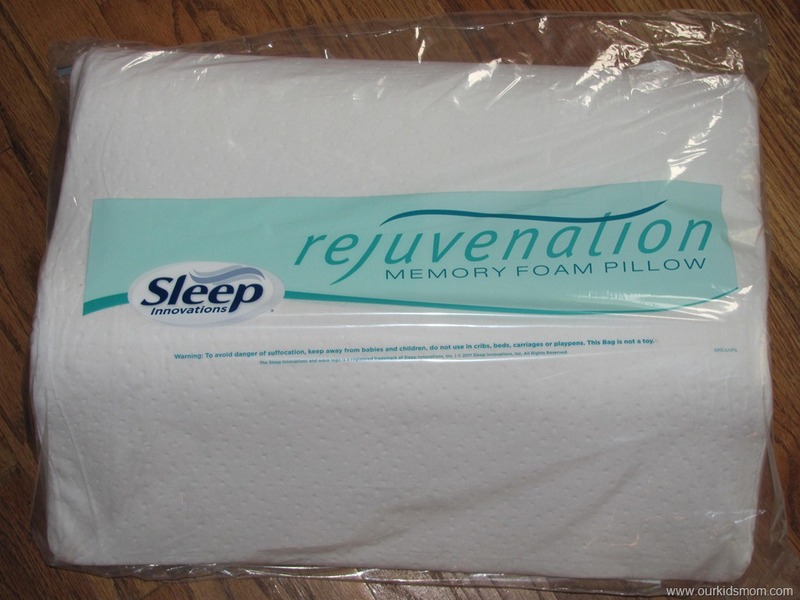 The Rejuvenation Pillow interests me. My favorite is the 12″ memory foam mattress! we could really use a new one! The “Vibes Vibrating Lumbar Support Back Rest” looks like an amazing product I have back issues and would love to have this for car rides. Thank you for the opp to win the mattress topper and pillow! pillows although I really want the mattress topper! I learned that most inner spring mattresses leave deep, heavy body indentations due to pressure but that the Sleep Innovations Memory Form prevents pressure from damaging the mattress, which is how it is able to provide more support and comfort over a longer period of time. How awesome! Bet you do not have to buy nearly as many mattresses or have nearly as many nights of horrible sleep contributing to morning back pain! It’s hard to choose..but I’m also kind of interested in the anti snore pillow. I like the Memory Foam Cluster Pillow too! Wow! I would love a 12 inch memory foam mattress!! I am in need of a new bed and this bed sounds awesome! I definitely need pressure points in my body relieved…..
I’d love to try the 12″ memory foam mattress! I am very happy to know that the products are made in the USA, you truly don’t see that very often. 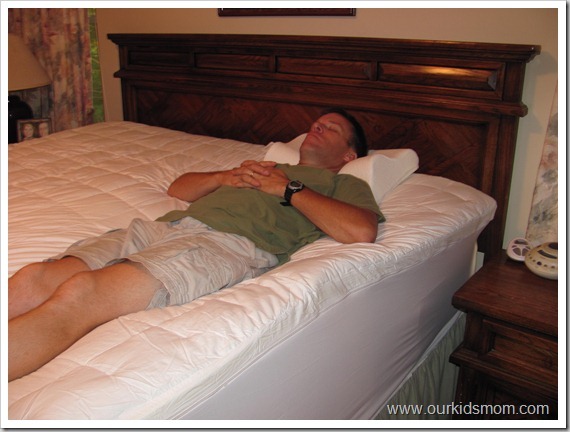 The 12″ Memory Foam Mattress looks pretty great!! my favorite item was the bed-ottoman bench! I would like to try the pillow. Looks comfy! The rejuvination pillow looks great and comfy. – Recommended for all sleep positions. I learned that A memory foam sleeping surface can actually improve your sleep by providing support while dramatically reducing the pressure points that occur during sleep. Reduced pressure points result in better circulation and fewer sleep interruptions versus a conventional sleep surface. My favorite item is the 12 inch Memory Foam mattress. I wish I had one of these! I like the massaging gaming chair. I like the vibes chair. My husband sits in one and this one looks way better for his back! 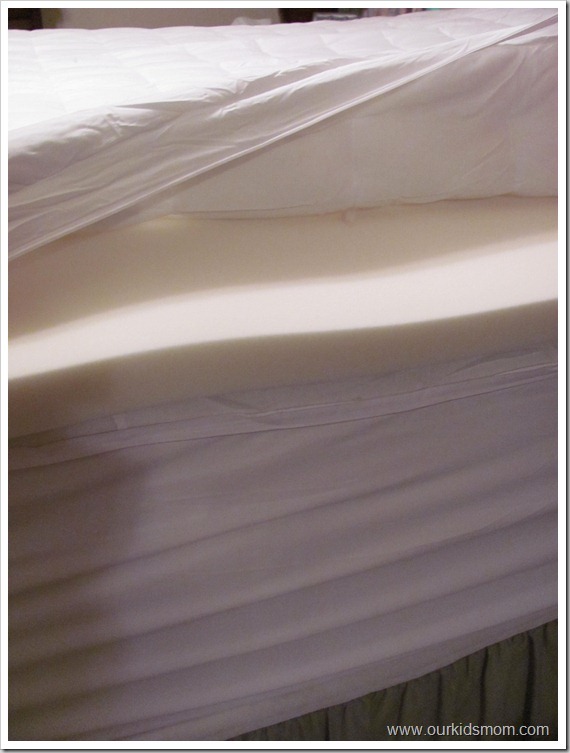 I love their pillow with Memory Foam AND Microfiber – talk about a good night’s sleep! One of the items I really like is the Vibes Messaging Game Chair. I’d love to try the Bed – Ottoman – Bench. I like the memory foam bed pillow. it appears it has what i would need for a good nights rest. The special ingredient in their product is Memory Foam. I would love to try the Memory Foam Cluster Pillow. I have my eye on the Memory Foam mattress. Bliss. Also I learned that reduced pressure points result in better circulation and fewer sleep interruptions, which I need desperately. I would love to have the bed ottoman bench at work! Would love to try the 12″ memory foam mattress! I would like the Sleep Innovation Gel-memory Foam mattress. I have chronic pain and think that it would help me sleep better. I’d love the Vibes Massaging Game Chair. I work from home and am constantly on the computer so this would be something nice to have while sitting in a computer chair all day. We’d enjoy the vibes massaging game chair. I learned that Sleep Innovations manufactures 100% of its memory foam in the United States. Pretty cool. I like the 2 in 1 Memory Foam/Micro Fiber Pillow. I learned that all of Sleep Innovations’ polyurethane foam products are Made in the US and free of known toxins. Our memory foam contains no formaldehyde, no PBDEs (polybrominated diphenyl ether), and no chlorofluorocarbons (CFCs). I think I like the mattress toppers the most. The mattress toppers is my favorite product! I think the 2-in-1 pillow sounds like something I need. I love the massaging game chair! I like the vibrating limbar support. Thanks for the giveaway. I would love to try the gel mattress topper. I went to the site, what question should I answer? I would love to try the Vibes Vibrating Lumbar Support. I thought the 2-in-1 pillow would be a great product to try. I would love to try out the Vibes massaging game chair! Wow! I’m shocked and impressed that they are USA made products, that is so hard to find anymore. I also love the vibrating lumbar support. I love the vibrating back support product! It looks awesome! 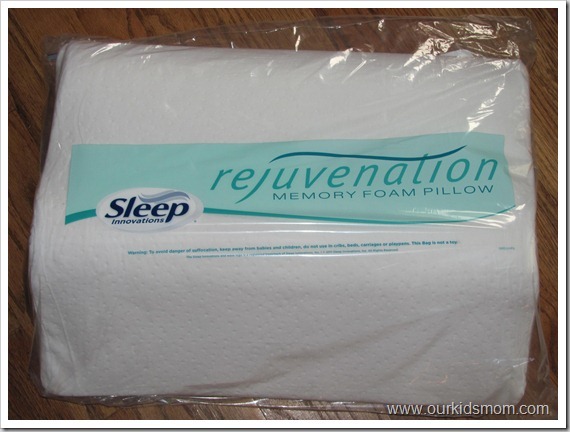 My favorite item is the rejuvenation memory foam pillow. My son had a stroke 4 years ago and I have tried so many different types of pillows only to be disappointed time and time again. He is still bed bound and so I am constantly repositioning him not only to keep his skin healthy but to aid in muscle comfort. He was only 17 when he had his stroke so he has grown almost 2.5 inches since he has been down. Foam pillows seem too hard and give him charlie horses. I learned that their products are made in the USA (YAY) and we would love the vibrating game chair! I love the B.O.B, this would be nice to have for sleep overs for the kiddos. I really like the memory foam bed pillow! I learned that memory foam provides exceptional therapeutic cushioning and support, significantly reduces pressure points, improves circulation, and optimizes sleep temperature. 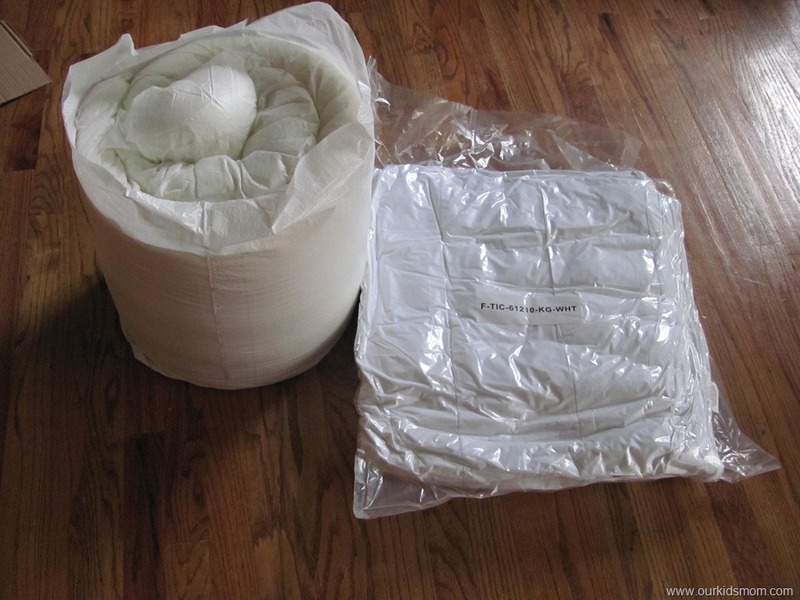 Love that pillow to mattress enhancer and the fact they are made in the USA! My favorite item is the massaging game chair. I really love that these products were made in the united states. I also like the 12″ Memory Foam Mattress. the memorie foam matress’s, lord knows need one and would sell a kidney to get one! My poor aching back would love the Vibes Vibrating Lumbar Support Back Rest. They provide optimum support and luxury. I like the Memory Foam Cluster Gusseted Pillow because it’s good for back and side sleepers and that’s how I sleep. Well, Sleep Innovations has introduced many mattresses, most of them are really of high quality!